Mutoh ValueJet-1324: 54? and Mutoh ValueJet-1624: 64? 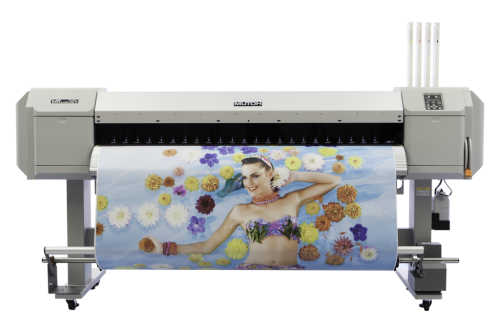 The Mutoh ValueJet-1324 and the ValueJet-1624 are outdoor printers, which have been specifically designed for long lasting Outdoor Graphics. They are capable of using Mutoh Eco Ultra Ink to produce outstanding full colours posters, photorealistic prints and External signage. Both come fully equipped with an automatic in-build cutter to cut off finished prints. The ValueJet-1324 has one print head with Mutoh’s newly developed Drop On Demand Micro Piezo Inkjet Technology, and is configured to 180 nozzles x 8 lines. The maximum media width on the ValueJet-1324 is 1371mm with a print width of 1361mm; it can also handle media up to 1.3mm thick. The average ink consumption is 720dpi is 8ml/m2 and use Mutoh Eco Ultra Ink. The UV Durability without lamination is 3 years. The ValueJet-1624 uses the same print head technology as the ValueJet-1324, the Drop On Demand Micro Piezo Inkjet Technology. However the ValueJet-1624 is capable of handling media up to 1625mm with a maximum print width of 1615mm. It can produce high quality prints at 5m2/h of 720 x 1080 dpi and has a maximum print speed of 29m2/h compared to 27.9m2/h for the ValueJet-1324.